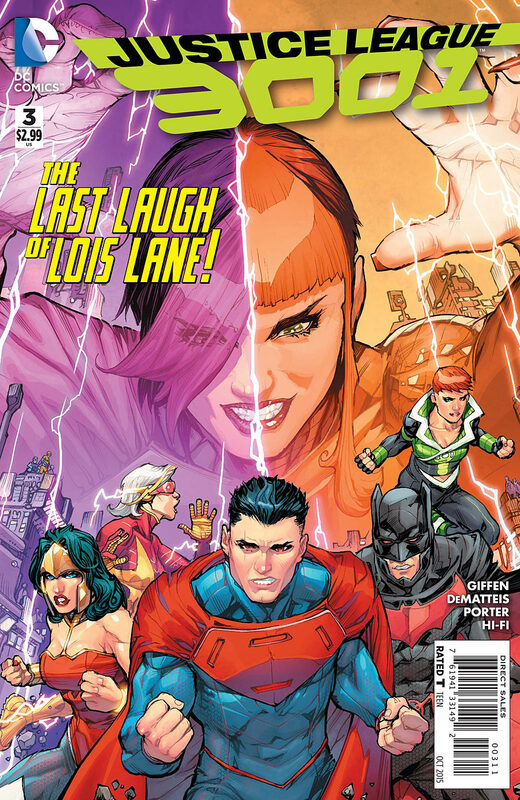 Justice League 3001 #3 came out last week and continues to be a very solid comic. I will admit that I was wrong for initially avoiding this book (and the first series JL3K) based on my impression that it was another look at a grim and gritty, dismal dystopian future. For a Legion fan who likes my future bright and Bgztl-y, I thought this book was truly a future's end. Lured to he book by new cast member Silver Age Supergirl, I went got this title since the beginning and then went back and bought the whole run of the first title. This isn't a shiny Legion future and it is a bit grimy. But it is smart and layered and fun. And put those words together and you get an entertaining book which I fear isn't recognized by the mass market. After a two issue story where the League fights Starro, this issue really sets up the future of this book, showing us the number of plots that are weaving their way through the book. There is a lot happening in this book, riffing on super-heroics, politics, and gender. Writers Giffen and DeMatteis are firing on all cylinders. As I said before, this is a smart book. Occasionally I have read these two veer a bit too much into slapstick 'humor' and fail. Not here. And artist Howard Porter's art is as dense as the story, bringing in detail and background material that takes a while to drink in. 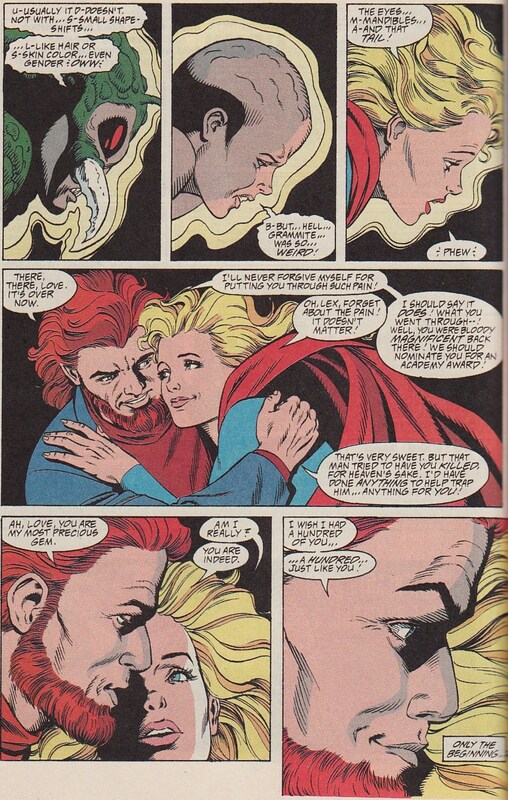 I love his Supergirl (which makes me think I need to find all his panels of her in Morrison's JLA). And the use of splash pages worked well also. We thought that Supergirl brought a quick end to the Starro enslavement of Wodin. But that victory is snatched away. Without Starro's hive mind, we learn that the Wodinians are primitive brutal people bent on killing each other. The Office of Fathomless Bureaucracy (O.O.F.B.) approved the enslavement to save the planet. Save the planet by enslaving it. That sounds relatively loathsome. You would think that maybe these people could have come to some peace on their own, or with help. I'm glad that the Teri Flash even realizes that slavery is never the answer. Of course, I love the fact that Supergirl is part of the team. And this is a classic Supergirl. She is proactive. She wants to do good. She doesn't suffer fools lightly. So this weird new universe is hard for her to swallow. Earth is a prison planet. Superman is a jackass. The Headquarters is a castle, the League treated like royalty. That last panel speaks volumes to me. Kara looks vexed, her arms crossed. This might be a 'Silver Age' Kara but this isn't the super-naive, super-sweet, super-innocent Supergirl. This feels like a 'middle of the Adventure Comics run' Supergirl, a bit settled and confident. 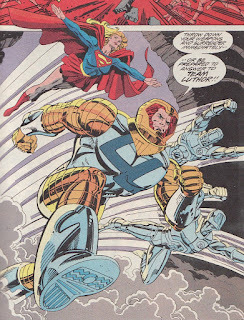 And as I guessed, Superman is jealous of Kara's power set. Remember that Guy forged the papers that made the Starro enslavement seem illegal. But with that turning out to be wrong, the O.O.F.B. decides that someone needs to keep a closer eye on this league and so sends a Starro drone to be part of the team. I have been following the gender politics of this Guy with some interest. Guy's DNA was put on a woman's body. So this becomes something of an internal conflict. The volunteer's biology and underlying DNA might be female but Guy's essence is of a man. But I thought this nugget was too interesting to pass. 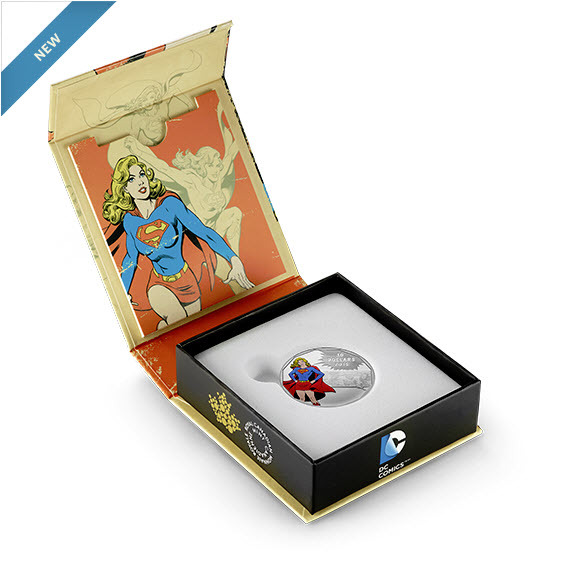 Supergirl has been floating in space for 1000 years after she was engaged in a covert mission to Apokolips. Could that end up as another plot in this book? Hope so. One thing missing in the New 52 was a feeling of World's Finest, of Superman and Batman being best of friends. It is hard for me to wrap my head around which is the 'past' for this League. This Batman and this Superman talk like they are imprinted as best friends in a more classic sense. 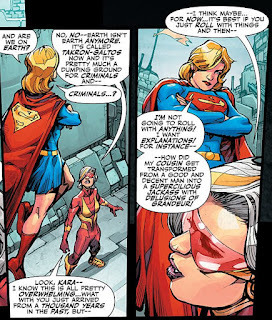 I mean, we have Silver Age Supergirl, Bwa-ha-ha JLA, and this friendship. Continuity be damned ... I love it. Here the two leave Camelot 9 to go to Takron-Galtos (Earth) for a secret meeting. Bruce can sense that Ariel isn't herself. I like this Batman who is as much a detective as he is a bruiser. But the League isn't the only League operating in this universe. The original Hal from JL3K, one of the Flashes from JL3K, Blue Beetle, Booster Gold, Ice, and Fire are all operating here as well. It is only a matter of time before these two leagues square off. And look who they battle here. 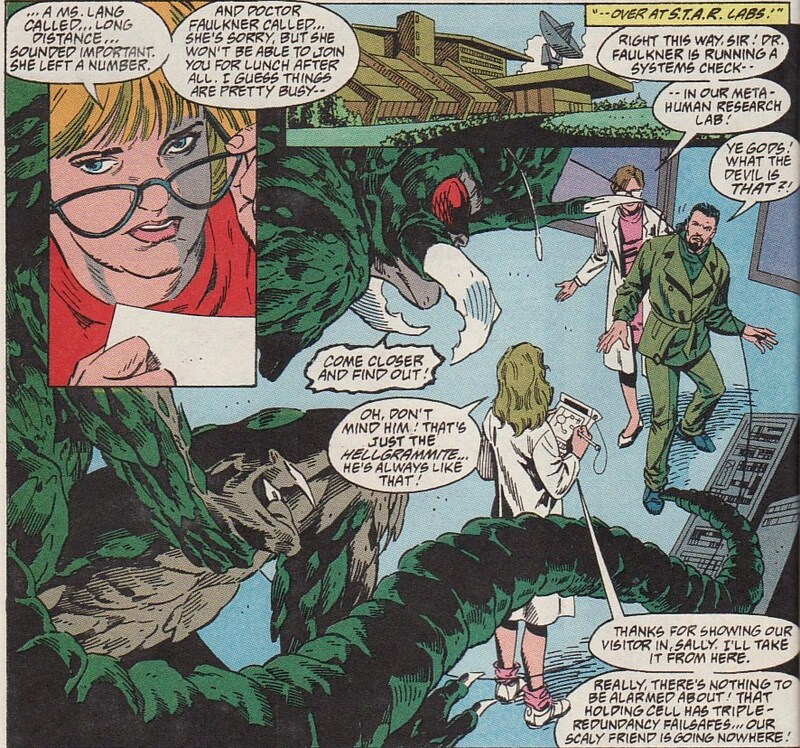 Initially a giant turtle smashing the city, the monster devolves into Jimmy Olsen. I think we are up to about 6 plot threads. On Takron-Galtos, Bruce and Clark run into Sheriff Tariq. Turns out that Tariq is actually one of the Convert's many bodies. He has been kept alive and hidden by Lois to keep an eye on things there. But Lois is a stern leader. She has kept a body of the Convert's in stasis, one she can kill and therefore kill the Convert if he doesn't obey. This is a conniving and diabolical Lois. After the way she has been treated in the main universe, I can see how she would become bitter and want to become the queen of the universe. On Takron-Galtos, which is a sort of free prison world, a place where prisoners can wander around, a prisoner-on-prisoner mugging is thwarted. And when Bruce goes to investigate we get this splash page. There is another Batman, one operating here. We see it's hand, which looks mechanical. So my money is on a Bat-robot like in Kingdom Come. Remember this is Earth so the Bat-cave is here somewhere. 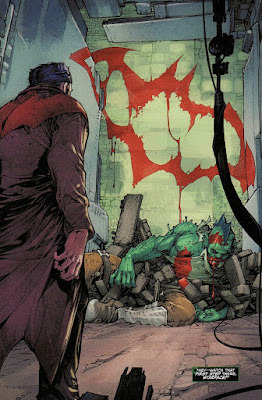 Imagine if this Bruce stumbles upon his past! I told you that the Guy gender issue is an interesting side plot. 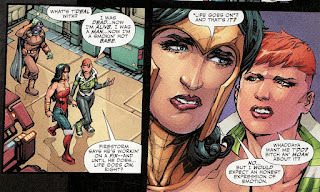 I like that Diana finally calls him on his blase attitude about his situation. This isn't something he can simply blow off as 'not a problem'. This isn't something he can find a cure for. So does Guy say she accept/want/know she's a woman? Or does he live his life as a man? Whatever he decides, in these times, this isn't something that can't be ignored and needs to be addressed. There isn't much Supergirl in this issue. But I love this end scene. Kara will bunk with Teri in the castle. And while Teri is super-excited, running around like an excited school girl and cleaning their room, Kara seems exhausted. I don't think this is an irritable Supergirl, a dark, nasty bad girl. I think she expects better from heroes. Her role model is the classic Supergirl. She probably has heard about the Legion. I would probably be irked if the future was this cesspool with these warped caricatures of the heroes. I love that last panel! Perfect. Supergirl in future, maybe with an old Apokolips plot. Two Leagues working in same time. New Batman on Takron Galtos. And also Starro drone in the League, Lois' possible conflicted motivations, Tariq as Convert, etc. I mean this is a complex book which has a lot of balls in the air. But it pulls it off so well, mixing the plots in and out, adding in humor in places, and keeping me engaged as a reader. 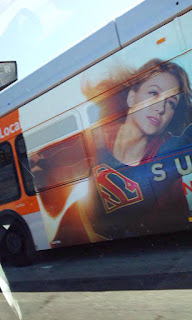 And it has a Supergirl I recognize and love. Please try this book if you haven't! 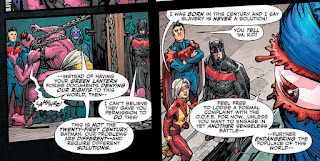 The Truth, the major new landscape of a depowered Superman whose secret identity has been revealed to the world, is now officially 3 months old. But it is only now, three months in, that we finally see how the world learned that Clark was Superman. Superman #43 came out this week, written by Gene Luen Yang with art by John Romita Jr. and inker Klaus Janson. And this is a tough issue to review. 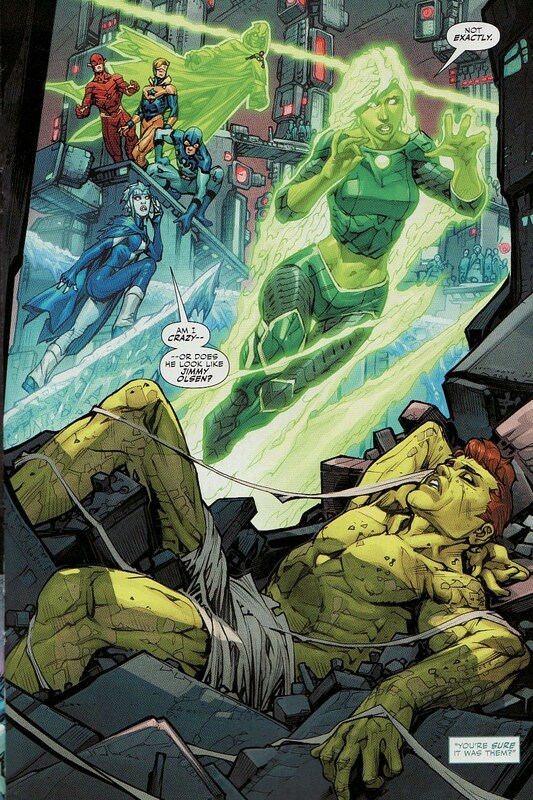 We have known since the end of Convergence that it was Lois who was responsible for the reveal. We have seen Clark snub her. We have seen this action labeled a betrayal. And we have been dealing with a New 52 universe where Lois has been pushed to the background so far that fans are waiting for her character to be sullied even more. This issue is basically a Clark and Lois issue, a full story of these two characters interacting. Amazingly, Yang writes a great Lois in this issue. We see how much she cares for Clark. We see how strong she is. We see how great an investigator she is. We see how smart she is. This read and felt like Lois. And that made me happy. Unfortunately, this is contrasted by Yang presenting Clark as being stubborn and, frankly, stupid. And I mean ... I don't understand almost anything Clark does in this issue. He simply gives into the villain, doing everything Hordr asks him to. He doesn't listen to Lois. 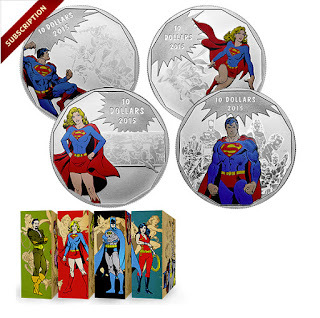 I'm not asking for the super-intelligent Silver Age Superman. I'm asking for a seasoned hero using some common sense. And there was none of that here. And the John Romita Jr. art here looks completely rushed and rough. I have never been a fan of Romita's work. But this looks almost like rough layouts in some places. Last issue, Superman brought down Hordr's base with yet another super-flare. And we saw him drained by some sort of odd energy creature. This issue opens in Lois' apartment where Superman has been unconscious for days recuperating from that flare. Lois, Jimmy and Condesa are there as well. The passing of these days seems to have softened Lois a bit. Last issue she was angry that Clark would keep this secret. Now, after seeing images of Superman being tortured (a flashback to early Morrison Action), she realizes that she can't be part of 'brutalizing' Superman. She promises to keep Clark's secret. The tears might be a little much. But it shows how much she cares. It is pretty simple. She likes Superman. She likes Clark. She almost fell in love with Clark. And if she can like them separately, she can like them together. Of course, Yang has this Clark immediately think that Lois is making a play for him. I love how Lois shuts that down, maybe in a little bit of a snarky way. 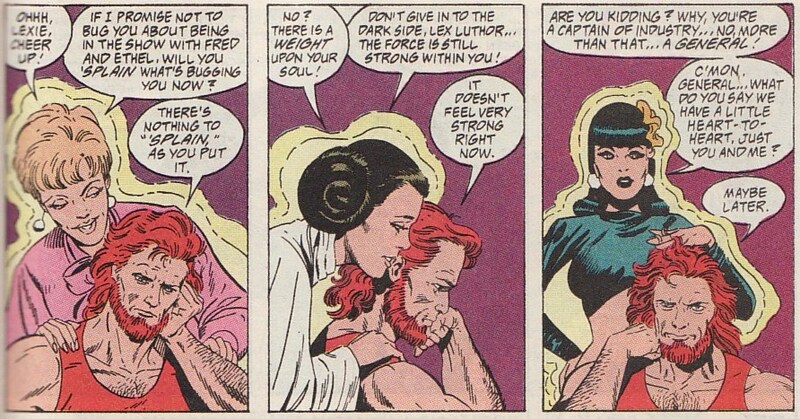 Again though, this really is a nice moment for Lois. One thing we learn here is that despite the time off, Superman still hasn't completely regained all his powers. He can be stabbed with a fork. He can't fly. Hordr isn't going to go away easily. Jimmy vomits up a tiny little Hordr-bot he had inadvertently ingested. And this bot co-opts Lois' phone. Using it as a communication device, Hordr shows Clark that he still has copies of all the images that would reveal his secret identity. Superman has to show up at another secret base or else. It is up to Lois to remind him that he doesn't need to give in completely to Hordr's demands. Why not investigate Hordr a bit? Why not find a weakness? Why not go a bit slow? It all sounds reasonable. Because why would you give into Hordr without pause? 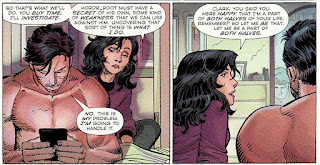 Lois convinces Clark to bring her with him when he goes so she can help. So hooray again for Lois. Inside Hordr's lair, Clark is led off to meet with Hordr. Lois also sneaks in and snoops. She comes across a body, burned out, drained, tied to a chair. My initial thought was that this was Ulysses, captured somehow by Hordr and sucked dry of all his hyper-energy. But it is clear, what ever this chair does, whatever this process is, it is lethal. 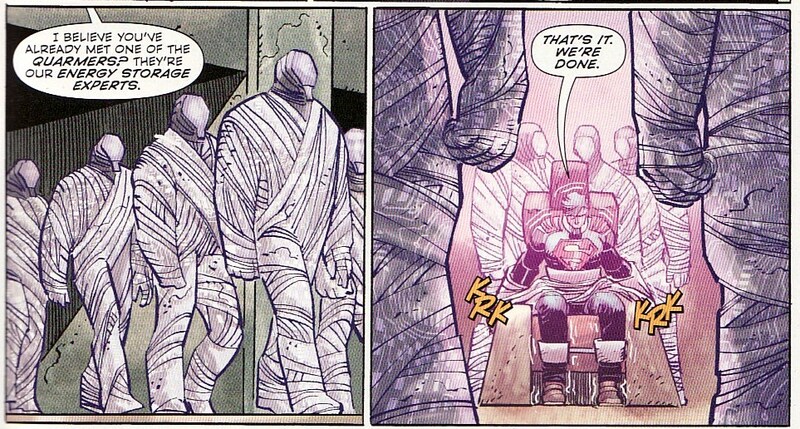 Clark is led into a room that looks eerily similar to that last one. Clark allows himself to be strapped to a similar looking chair. He is surrounded by Hordr's Quarmers, energy storage experts. And Hordr asks Clark to demonstrate his solar flare power again. And here is the thing ... Clark agrees. Despite knowing that one of these things drained him and changed him (remember, stabbed by a fork moments ago), despite knowing that giving Hordr this energy will give the villain incredible power. 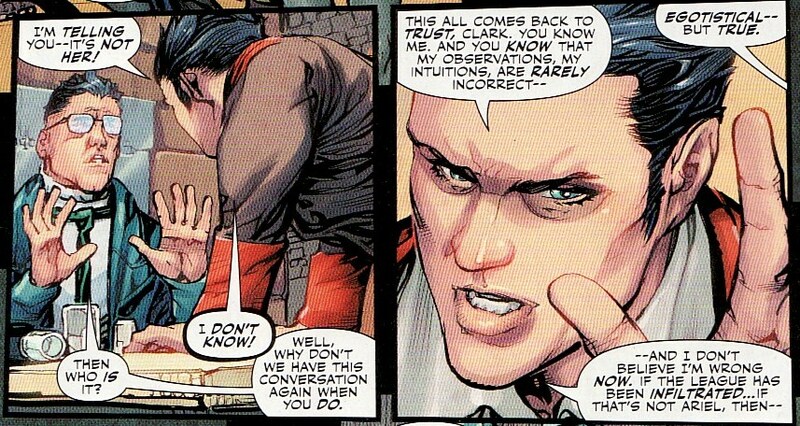 Despite basically aiding Hordr, Clark agrees. 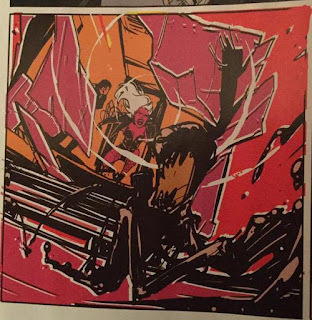 Yes it is great that Yang names them Quarmers, a throwback to the Sand Superman story I love so much. But why would Superman do this? After seeing the drained dead guy and now this set up with Quarmers surrounding Superman, I was reminded of the scene in Howl's Moving Castle where the Witch of the Waste is drained of all her power. And so Superman flares and the Quarmers (who now look like the Destroyer in the first Thor movie) drink in all that energy. Lois runs in and knows that this could end up with Superman dead like the body she tumbled upon. If his identity being a secret is the only thing keeping Superman in that chair then she will take that stumbling block away. She send the pictures of Clark changing into Superman to the web. Not a betrayal. Not because it is a huge story. But the art here is so sparse. That Lois panel is pretty rough. 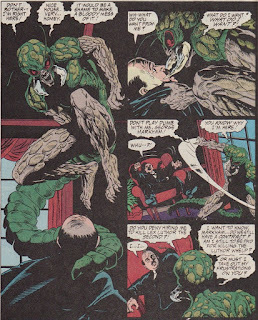 Knowing his identity is revealed, Clark breaks out of the chair and bashes the Quarmers. Hordr teleports out. So all that is left is Superman being angry at Lois. Even as she tries to explain why she did it, he just keeps yelling. His friends will now be in danger. But Lois knows, that his friends would put themselves in danger to save him. And that he means so much to her she is willing to do that. On cue, General Lane and the military shows up. How the heck did they know that is where Superman was? Were the helicopter engines idling on a nearby base so they could streak there? It seemed fast. And before Lois can talk about the burned out husk of a man tied to a similar chair, before she can explain it all, Superman leaps away saying having Lois in his life is a mistake. So I started out saying that this was a tough issue to review. It is a tough issue to grade. Because finally ... 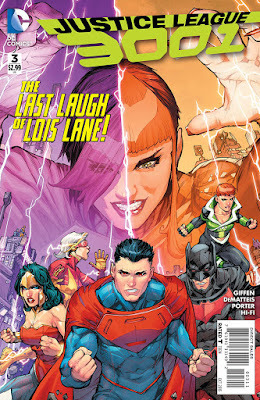 FINALLY ... we got an issue truly starring Lois. And Lois is presented wonderfully. So hooray for that. Truly. But this is undone by the inane presentation of Clark who is willing to stick his head into the lion's maw, to do whatever the villain wants him to, to not listen to his friends, to not think through the problem. And the art doesn't elevate this story at all. I have been looking at Crisis on Infinite Earths #7 over the course of this summer. With coverage of the issue itself over, I have been looking at some of the fallout from Supergirl's death. 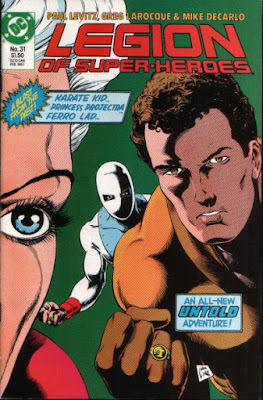 Remember, Crisis on Infinite Earths #7 came out in July 1985. When Crisis ended, the history of the DCU was rewritten. 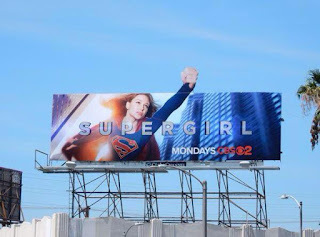 Supergirl never existed. And yet in Legion of Super-Heroes #31, a book which came out in November 1986, still had a piece of Supergirl history. Now it is one thing to have this happen in the immediate aftermath of the Crisis when creators were dancing through the raindrops of continuity issues. But this is a year later ... and months after John Byrne's Man of Steel, a book which cemented Superman's history as being Kara-free. 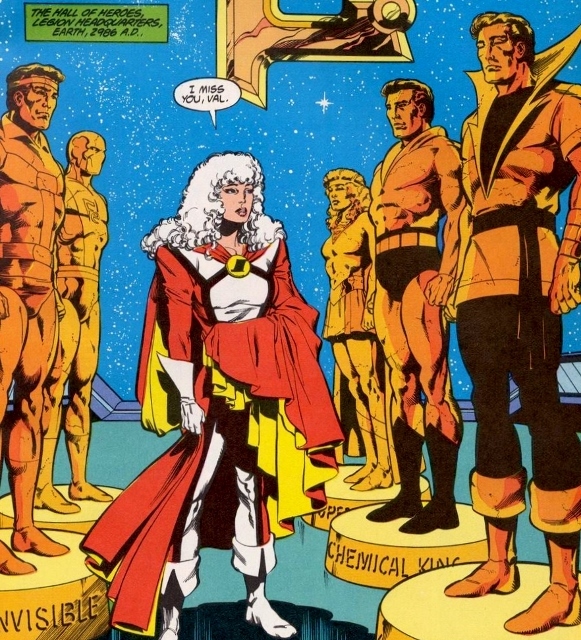 Here on the opening splash page of LSH #31, Sensor Girl is walking amidst the monuments of the fallen Legionnaires. And there in the background is Supergirl's statue! How great that writer Paul Levitz and artist Greg LaRocque snuck this little beauty into the background. I wonder if editorial saw it and decided to keep it or if it snuck under the radar. At least this book recognized Supergirl as the hero she was, saving the multiverse and being a valued team member. It wasn't the last time this very book thumbed their nose at continuity and included a Supergirl reference. But that'll wait for next week. 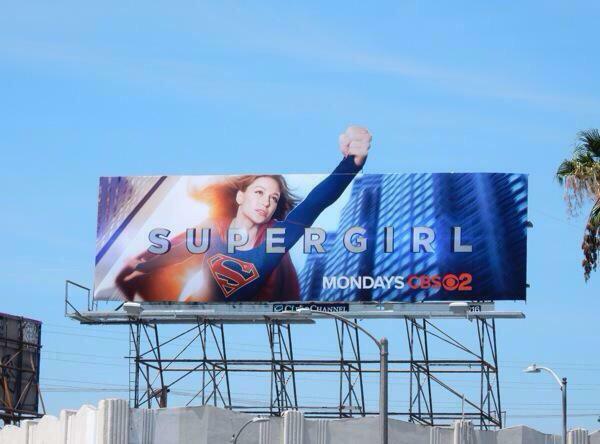 How big is Supergirl right now? Canada is putting her on money! Okay, maybe not the day-to-day currency. We are talking about those commemorative coins that I see when flipping by QVC. The Canadian Mint is putting out a bunch of DC hero inspired silver coins. 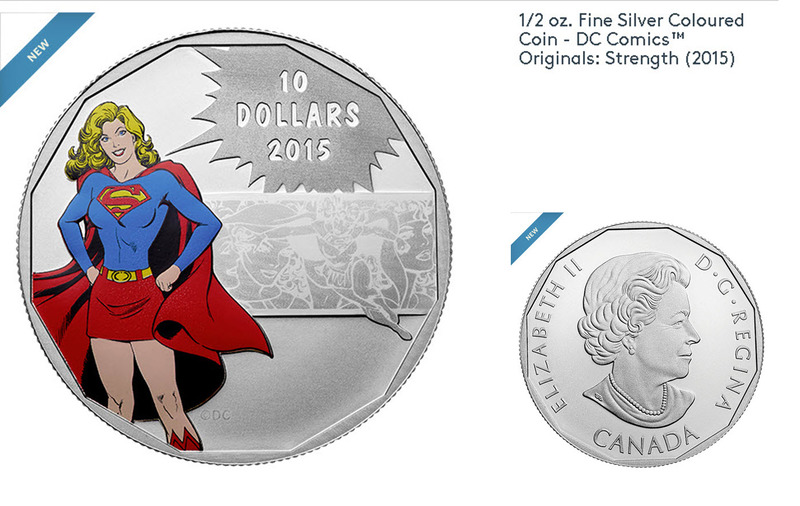 And they might be $10 silver coins, they sell for just under $55 canadian dollars. But boy, are they beautiful! Check out this one with Supergirl wearing a Matrix-style costume, hands on hips, beautifully smiling. 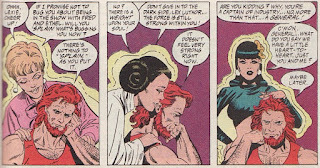 This is the work of Jose Luis Garcia-Lopez. 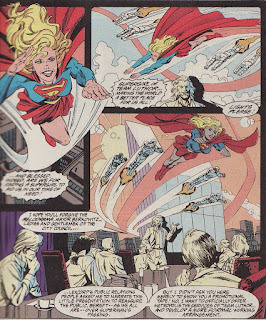 And the etched background panel is Garcia-Lopez' style guide of the headbanded Supergirl. 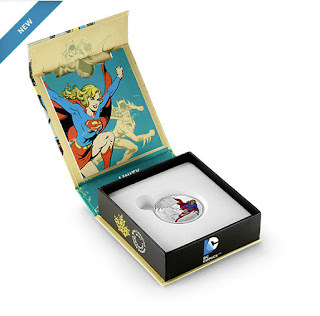 It comes in a beautiful box, again adorned with Garcia-Lopez stock art. 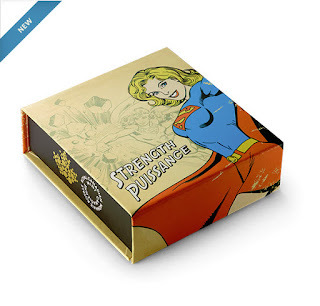 And the outside of the box has the theme of 'Strength' (or 'Puissance') . Just a gorgeous box. 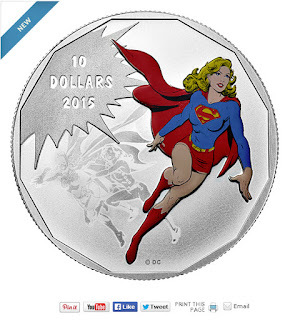 There is a second coin as well with a flying Supergirl on the coin. This time the etching is of classic Batgirl and Wonder Girl, a sort of bronze age SBFF's. Once again the box is lovely. 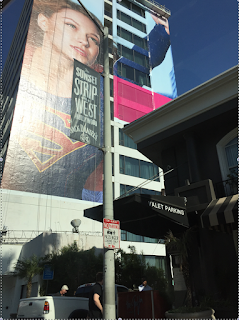 Now we have Supergirl in color with Batgirl behind. Lovely. 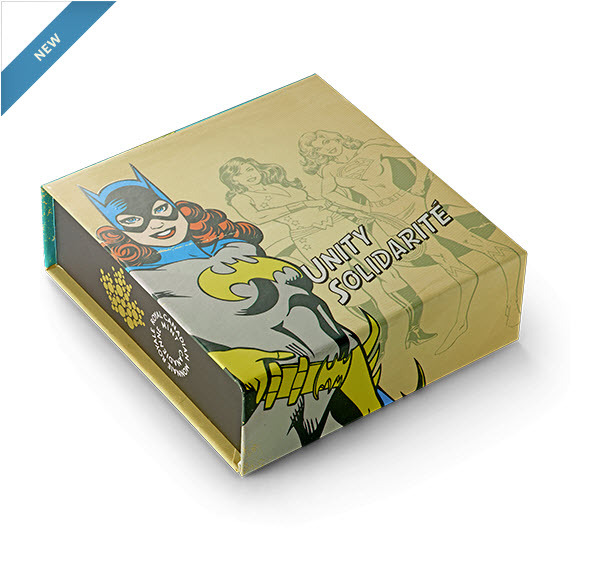 Interestingly enough, this box is Batgirl centric with Supergirl and Wonder Girl in the background. 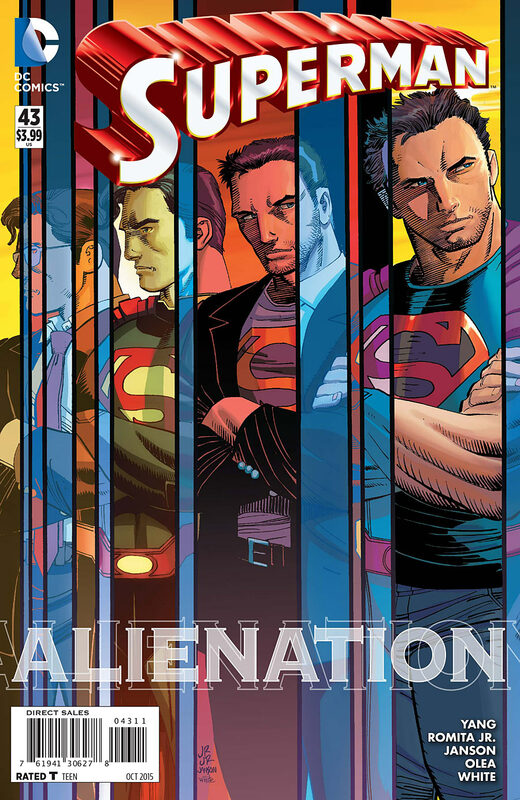 There are others in the series with Superman. I really just want the boxes! Look at the old school Wonder Girl one! So fantastic. Are any of my Canadian friends going to splurge? The Boston Comic-Con was just about 4 weeks ago and I have a couple more commissions to showcase. One of the artists that I was hoping to grab a sketch from was Annie Wu, current artist on the Black Canary title. I have enjoyed the sort of scratchy energy that Wu brings to that book. The art is the perfect match for the tone of that book. 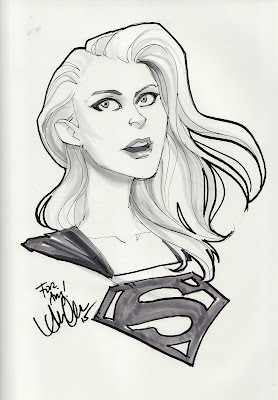 I thought a Wu Supergirl would be an interesting take on the character and so approached Wu on Friday afternoon. 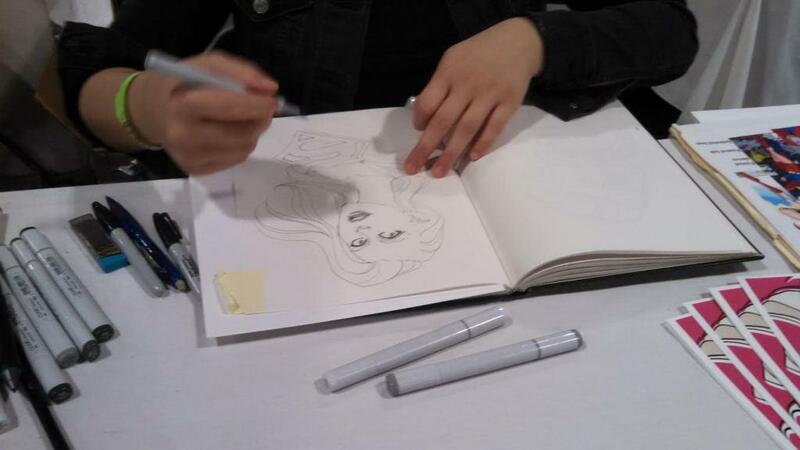 Her table was busy and she was sketching away and signing books. And, unfortunately, she said her list was full. On Saturday, I never really had the opportunity to head back to her table. Sunday morning I strolled by Wu's table early on and no one was there. I asked if she was taking sketch requests and she said her list was open. And so I was able to grab the delightful sketch above. There is a sort of fresh feel to this Supergirl, something about the hair and expression that makes this fantastic. 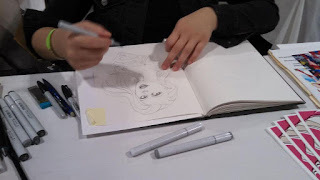 I usually don't hover when artists are doing the commissions but Wu told me that she was doing it right then and I could stick around if I wanted. So I was able to grab some process pics. I love this 'behind the curtain' peek into the process. And as I said, her work on Black Canary is just electric. If you aren't reading that book, you should be! Lee Loughridge adds a ton with color choices. But this is just so kinetic. 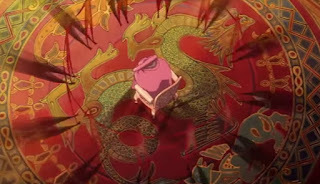 How do you know you have been blogging about a character for a long time? When you realize you want to revisit an issue that you have already covered. 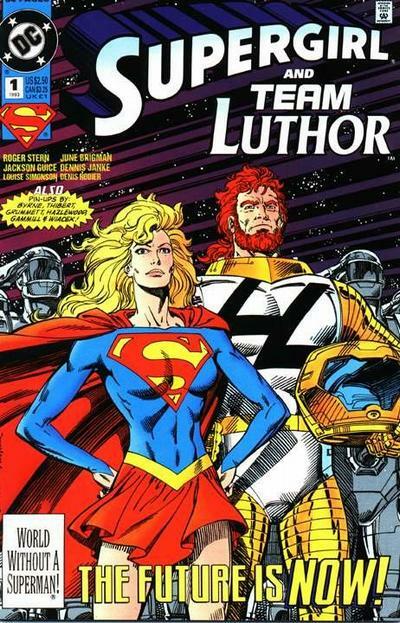 Back in 2008, I reviewed the stand-alone issue Supergirl and Team Luthor. It was my 12th post ever. That is a long time ago. The review was brief and too the point. With recent announcements of supporting characters and super-villains coming to the Supergirl show I thought I would dig up a back issue that highlighted one of the guest reveals. I have already covered a lot (if not all) of Reactron's appearances. I already covered all the recent Lucy and General Lane stuff. I even have highlighted some old Lucy Lane. That left Livewire and Hellgrammite. Now neither have had any major interaction with Supergirl but Hellgrammite comes the closest. With that in mind I thought I would look back at Supergirl and Team Luthor and review the longest story in the issue a bit more closely. "The Future of Metropolis!" was written by Roger Stern with pencils by June Brigman. Brigman's art is inked by Butch Guice and Dennis Janke. This feels more like a Luthor story than a Supergirl one. This is a dense read at times of Luthor's state of mind. From corporate espionage to Lexcorp's entertainment division's annual projections to his dealing with own sense of immortality now that he is in a younger body, we really get a lot of Lex. There are pages of what read like business meetings which, while giving me a very good sense of Lex, are at times ponderous. Luckily, those pages are split up with some action sequences with the Matrix Supergirl. This story takes place right after the death of Superman storyline. Superman has died at the hands of Doomsday and Metropolis is still recovering, both physically and emotionally. And Lex Luthor II, the cloned young version of Lex, isn't going to let a moment like that pass without taking advantage. 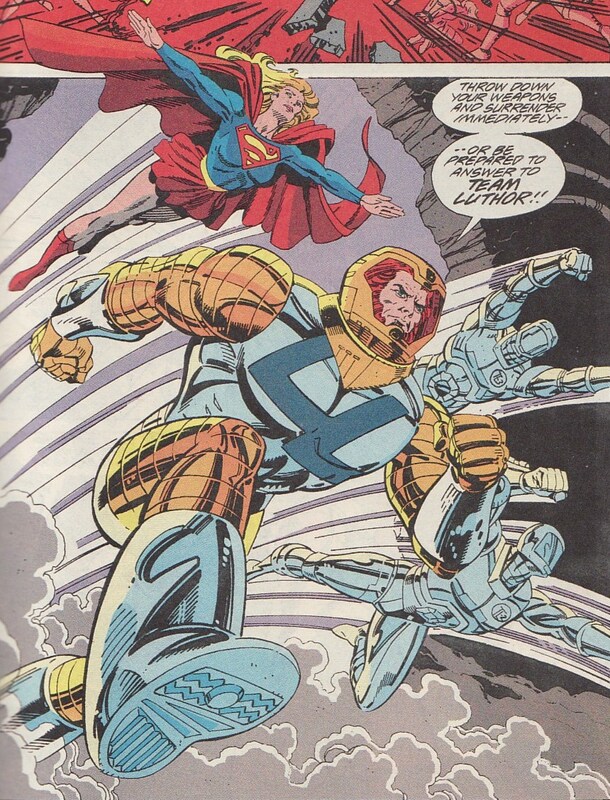 The first advantage Lex will press is replacing the presence of Superman with Supergirl and a Team Luthor security squad. 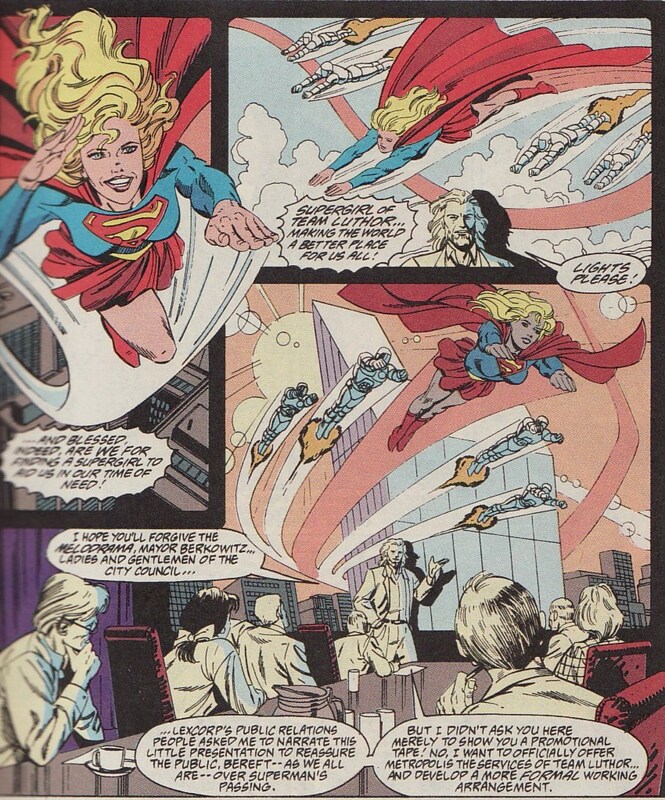 The opening pages are a propaganda piece about Supergirl where Lex co-opts some of the most famous Superman beats, making them Supergirl descriptors. Now it is she who is faster than a speeding bullet and more powerful than a locomotive. 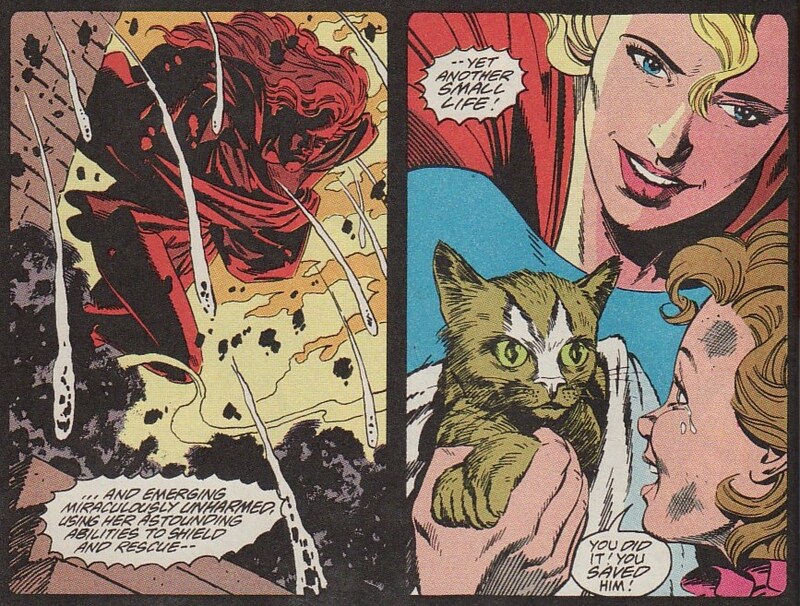 And Lex pours on the sentiment, showing Matrix not only saving lives, helping with fires, but even saving kittens. It is an almost perfect rewriting of the Superman legend, substituting Supergirl into the mix. And so we see him unveil the titular group of Supergirl and Team Luthor, a sort of Red Rocket squadron or phalanx of low-level Iron Man analogs who will protect the city in this time of crisis. 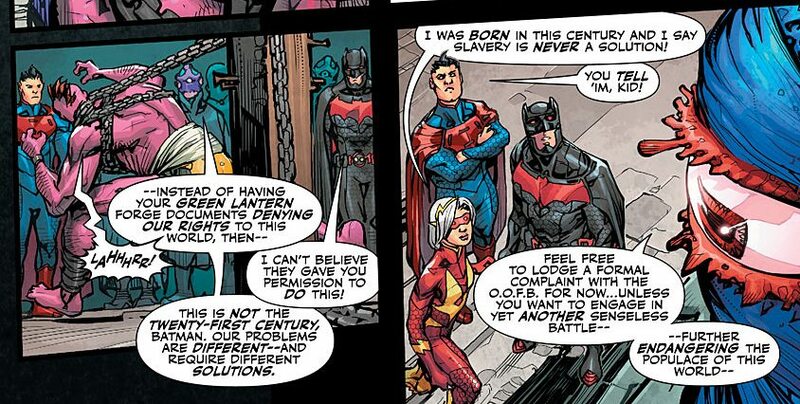 You can see how Lex is using the Crisis to further insinuate himself into the workings of the city. He is showing this movie to the city council and mayor. He wants to suddenly be part of the inner workings of the city. I am sure this isn't all magnanimous. I thought this promotional video was a great opening sequence. 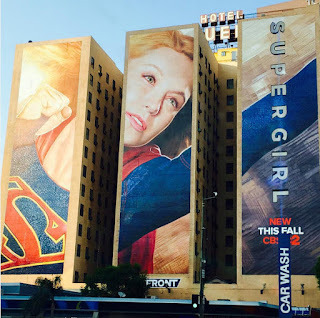 We see how heroic Supergirl can be. We sense how earnest she is in wanting to help people. 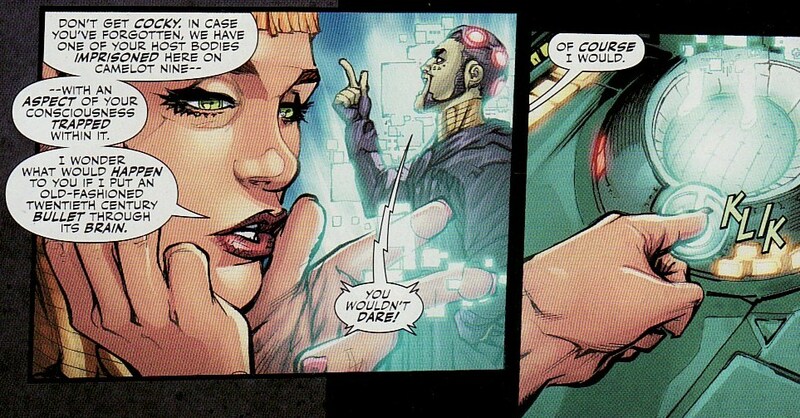 But we almost immediately get the sense that she is being used by Lex. While Luthor does dominate much of this story, there are some great Supergirl moments which are worth reviewing. 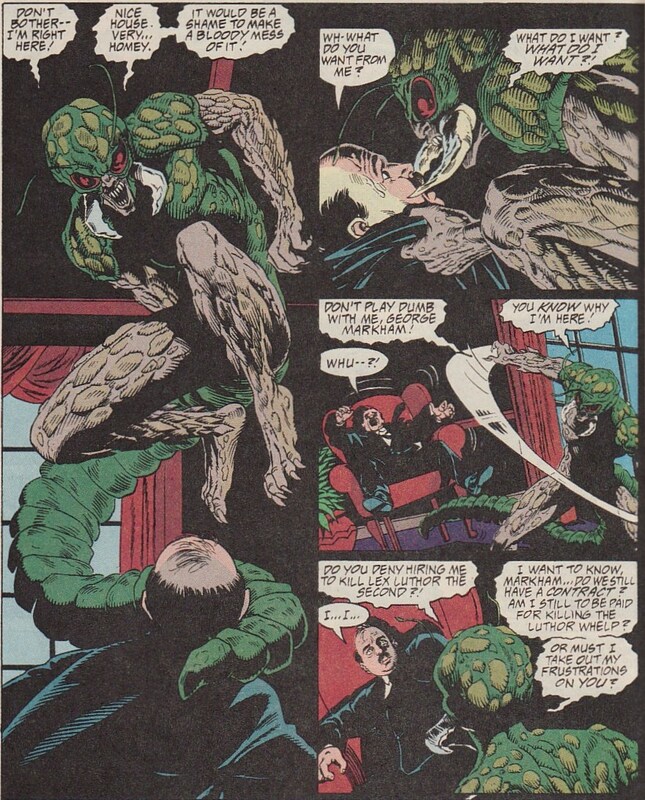 This story is in the immediate aftermath of Doomsday's attack. There are demolished buildings in the streets. There are people missing. The city is still cleaning up. And Supergirl is helping out as much as she can. We see her lifting sections of a destroyed building and rescuing a man who has been trapped in the rubble for three days. But this living man rushed away in an ambulance is contrasted by a huge group of shrouded dead, victims of the attack. Showing the cynical times, reporters swarm Supergirl asking her if she is doing this for glory, to overshadow the hard working police and fire departments. 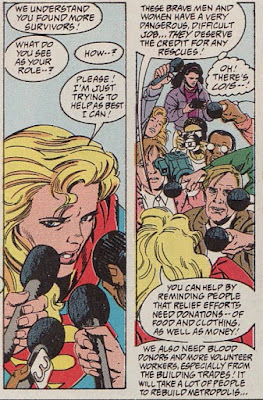 Supergirl simply says she wants to help and that everyone can in many ways. 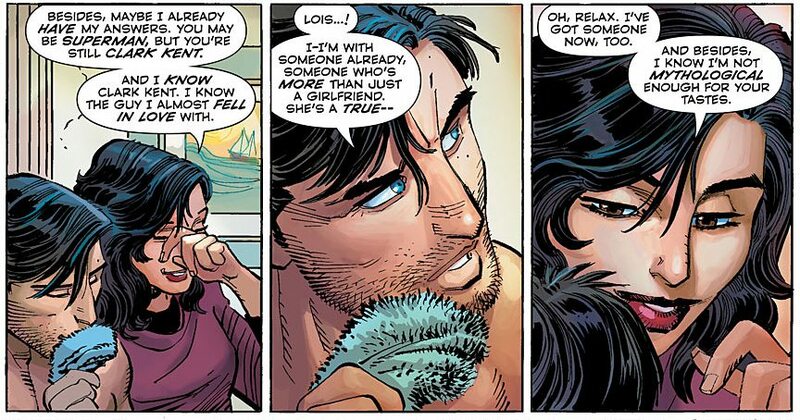 And then there is a great moment with Lois. Lois is working the stories. But she is grieving. In a nice moment of humanity, Supergirl wonders if her flying around wearing the S-Shield is appropriate. Does seeing Matrix as Supergirl make Lois hurt more? I love Lois' response. The city needs someone super. And Matrix is honoring the name. 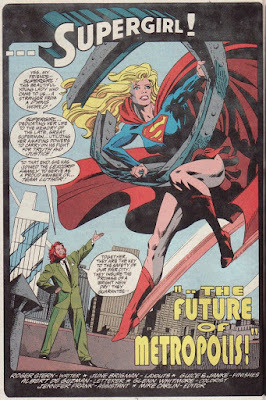 I had a lot of issues with the early Matrix Supergirl. But I have always felt that it is around this time, especially in Funeral For A Friend, she sort of turns it around, becoming an independent hero. 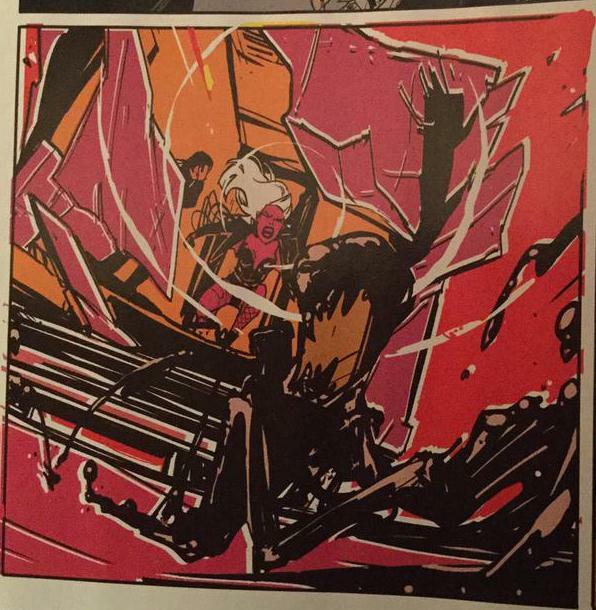 But Anj, wasn't this supposed to be some sort of look at Supergirl and Hellgrammite? Hellgrammite is Roderick Rose, an entomologist who mutated himself into a bug-like monster. He has super-strength, jumping ability, and the ability to make webs/cocoons. 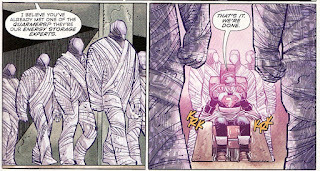 He also was hired by a LexCorp manager Markham to kill Luthor and ended up being imprisoned in S.T.A.R. Labs. And here he is, trapped at STAR in a rather public cell. STAR is taken over by a terrorist cell who wants to steal the lab's body armor prototypes and destroying all electronic copies of the IP. And Hellgrammite is there to witness it. Within moments of this attack, LexCorp gets wind of it and so in comes the cavalry. Supergirl and Team Luthor swoop in and save the day. But in this attack, Lex is injured, his leg broken by falling debris. Lex makes it so easy to hate him! As I said, these early Matrix stories are hard to read. And as a Supergirl fan, this was a tough time. She had gone crazy. She had banished herself to space. She had become a Brainiac slave. And now she is in this weird relationship with Lex. In a scene that gets played out a couple of times, we see her change shapes to try to please him. Lucille Ball? Princess Leia?? Bettie Page??? It is creepy. And it shows just how little this Supergirl thought of herself. But with Lex it is all about control. He will 'mold' Supergirl. He will control her. She will follow his agendas. 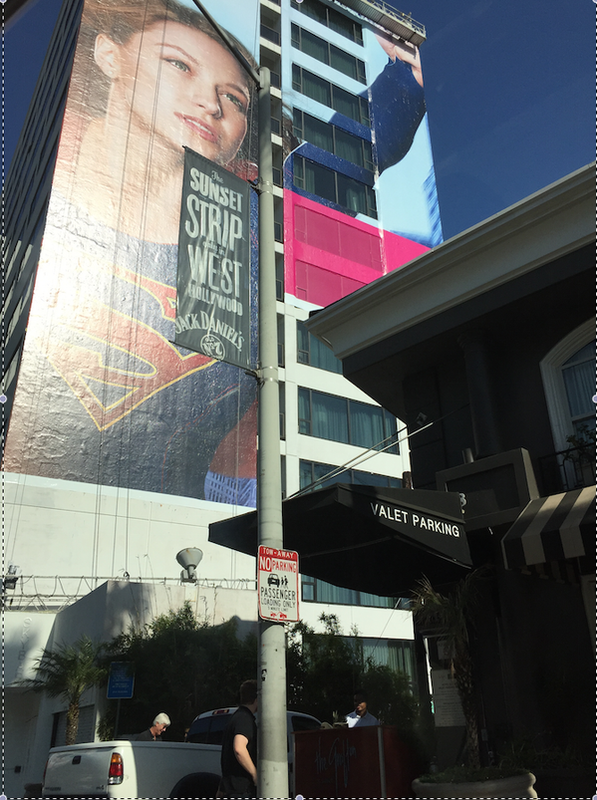 At the very least, despite all this, Stern continues to show that, at least for now, Supergirl still has her heart in the right place. We see her doing what is right, earning the respect of the other Team Luthor members, and acting as a leader. 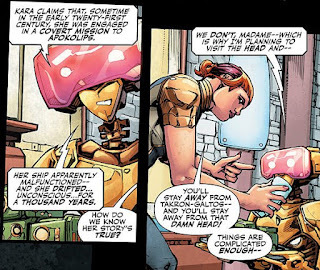 Finally we get to the Supergirl/Hellgrammite part of the story. It seems Hellgrammite escaped during the STAR labs attack. And his first stop is the home of George Markham, the Lexcorp employee who hired him to kill Luthor. Hellgrammite wants some of the money Markham promised him. Hellgrammite wants to know if Markham's contract is still valid on killing Luthor II (since the original target Luthor I is 'dead'). Hellgrammite is unbelievably creepy, all tail and clicks and violence. Markham shouts that yes his contract is still valid. He wants Luthor dead. Suddenly the lights go on and we see Lex and Team Luthor in the house, taping this admission. Well 'he' turns out to be Supergirl. Matrix morphed herself into the shape of Hellgrammite to coax out the confession. But it wasn't easy. It is painful for her to so dramatically change shape. But she so loves Lex she was willing to suffer. We end with some ominous foreshadowing, a plot thread followed up in the Supergirl mini-series. Lex would love a hundred Supergirls. 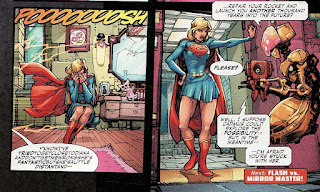 Okay, this was a lame excuse of a Supergirl/Hellgrammite issue. But there aren't many (or any) to choose from! And as I said, this as much Lex's story as Supergirl's. As I said before, this is a good issue to have in a Supergirl collection as it highlights a sort of time where she was changing, becoming a more solid member of the DCU, a hero in her own right. We get two more stories and some pin-ups in the back. And it can be found in $1 boxes if you look hard enough. Hope you enjoyed this look back at a world without Superman. I don't think we have to ask any more if CBS has confidence that Supergirl is going to be a hit. They are plastering images of Supergirl everywhere. Head to Twitter and you will see images of Melissa Benoist as Supergirl everywhere. 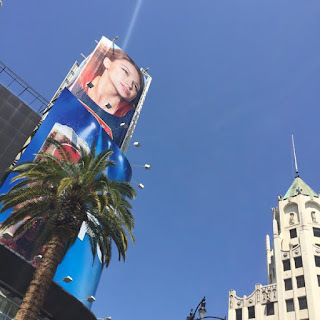 She's on wings of buildings making one big image. I am amazed that I live in this world where my favorite character is finally being recognized as the star she is.